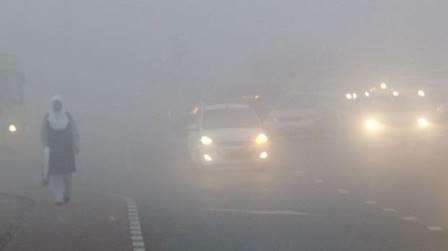 Fog can be a very serious problem as reduced visibility makes spotting driving hazards much harder, if not impossible. Knowing how to deal with foggy conditions is extremely important, so follow our guide. Not all cars come with front fog lights, but all modern cars are equipped with rear fog lights - as it is the law. They are a legal requirement in most parts of the world. Turn your fog lights on and keep them on until you are clear of the fog. Turn them off when you are out of the fog as they will dazzle other motorists. The switch is usually located on the indicator stalk, or headlight knob. You should check your car’s manual so you know where the fog light switch is (they’re never hidden). If you wake up to a thick blanket of fog then the best thing to do is send a text message (even a picture message) to your boss telling them that you are going to be late in. Any boss who has a problem with this isn’t worth working for. Your safety is the most important thing, so wait for the fog to clear before you set off. Listen to the traffic reports on the radio or check UAE Traffic and UAE Weather on Twitter before setting off. If you set off from home and all is well and clear, but encounter fog en route, then slow down and pull into the next service station and wait for the fog to clear. It may take an hour or so, so have a coffee and let your boss know that you’ve stopped until it is safe to continue your journey. Driving along a road at 120km/h in fog is dangerous and irresponsible. Reduce your speed to no more than 50km/h and stay in the inside lane. If the fog is very thick, slow down to 40km/h. Be on guard at all times. If you are driving in fog, you must turn your headlights on. Make sure they are dipped (i.e. normal). Driving with your main beams on (denoted by the blue symbol on your dashboard) is dangerous to oncoming traffic as it dazzles other motorists. Never drive through fog with your main beams on, and if your car has automatic headlights, make sure they are on, don’t assume they would be before checking. There is a lot of confusion when it comes to driving with your hazard lights on in fog. Some people do it to make themselves more visible, which is a good intention, but not wise and can cause an accident. If it’s foggy then it is likely going to be cool, which means that condensation may build up on the inside of your car. This will affect your visibility even more. The heater will help keep your windows clear. Turn your radio off and open your window a little. Listen carefully to your environment outside of the car. You may hear another vehicle that you can’t see, or you may hear something or someone warning you to stop. You’ll be driving at a reduced speed so wind noise won’t be too much of a problem with the window down. Don’t change lanes unless you have to. Stay over to the inside (right lane) and don’t hurry yourself. Constantly changing lanes is potentially dangerous as it could cause an accident. Remember that motorists behind you may not have seen you. Pick a lane and stay in it.